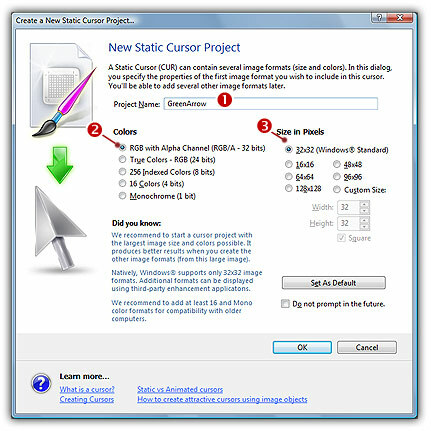 How to create attractive cursors? This is the question. 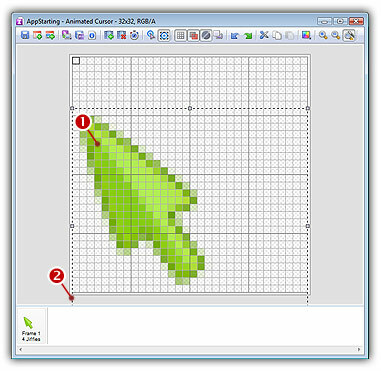 The primary solution is to draw cursors using either an image or vector editor. 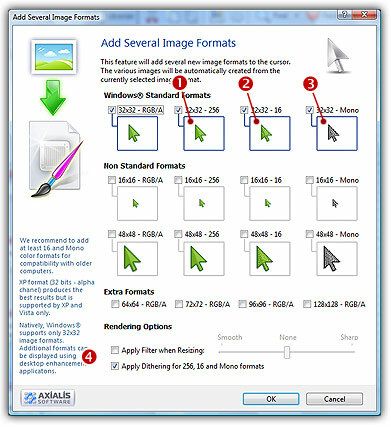 Then, when the image is done, use Axialis CursorWorkshop to convert this image to a cursor. Also, if you don't want to use an external image editor, Axialis CursorWorkshop contains some drawing tools that permit you to draw your own cursors. But most of us are not graphic designers and we have a problem when it comes to create attractive cursors. 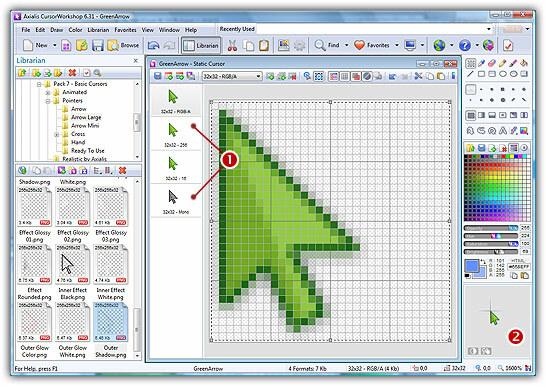 The question is: "How to create attractive custom cursors without drawing skills?" Image Objects are the answer. The solution is to use a set of image objects already done by skilled computer graphic artists, and assemble them together to create a final artwork that will match your needs. Using a set of existing image objects the possibilities are almost infinite. 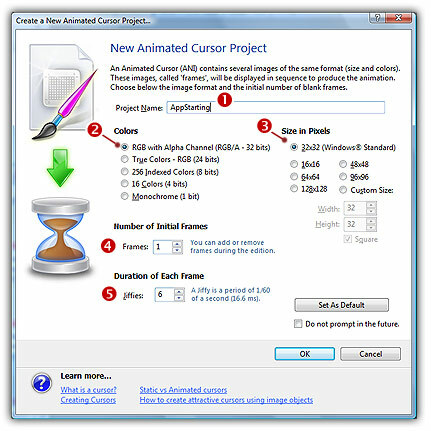 You can create many different cursors or graphics simply by adjusting various parameters of each object like Hue (teint), Saturation, Brightess, Contrast, Size, Opacity and more. To follow this tutorial, the object pack "Basic Cursors" must be installed in the librarian. Search the Librarian for the folder "Objects\Pack 7 - Basic Cursors"). This pack is included in Axialis CursorWorkshop 6.31 or more. If you can't find the folder, download the pack from Axialis website. In this first part we'll create a static pointer cursor. We'll start by making the 32x32 RGB/A image by assembling objects, then we'll make the other formats from this image. 2. Type the name of the project ( ): "GreenArrow". 3. Now specify the format of the first image to add in the project: In Color , choose "RGB with Alpha Channel (RGB/A 32 bits)" ( ). In Size in Pixels , choose and "32x32 (Windows Standard)" ( ). 4. 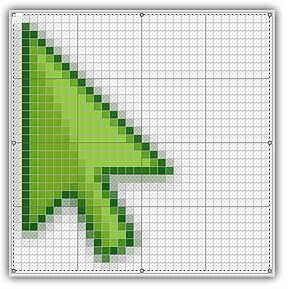 When done, click OK. A new static cursor project window is created with the 32x32 format created. 5. Now let's add the image objects. Before we start, don't forget that each step of the creation can be undone/redone (Ctrl+Z/Ctrl+Y) up to 16 steps back. In the Librarian window (choose View/Librarian if it is not visible), select the "Objects/Pack 7 - Basic Cursors/Pointers/Arrow Large" folder ( ). A list of available object is displayed in the contents window below ( ). Find the "Back Web2 Green.png" file and select it ( ). 6. Use a mouse drag and drop to add it into the project as shown above ( ). The object is added to the project as a floating selection ( ). Take a look at the quality of the artwork in the Scale 1:1 window ( ). You've just added your first image object to your project! As you can see it's very easy and intuitive. Now let's continue and add other objects to build the cursor. IMPORTANT - To follow the next steps, the "Preserve Transparency" option must be set (press "T" or select Draw/Preserve Transparency). If this option is not set, the transparency will not be kept each time you add a new image object and the objects already added will be fully replaced. You can ignore (select or not) the 32x32 RGB/A image format already present in the image. You can also apply or not the dithering option to the 256/16 color images (try and see the results in the preview images). 10. The last operation is to set the hot spot. In the editor area, the hot spot is shown as a square slowly blinking from white to black. 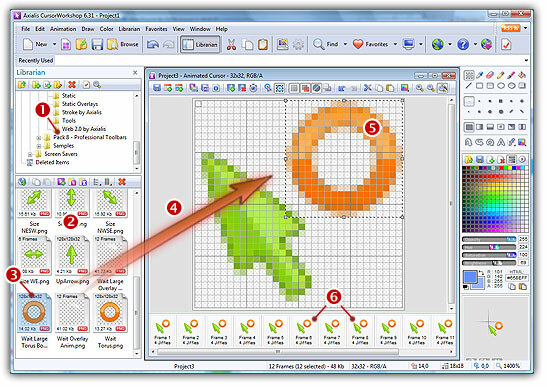 If you don't see the hot spot, activate the visualisation: choose Draw/Show Cursor Hot Spot or press Ctrl+K. 11. Select Draw/Set Cursor Hot Spot or press K. Click to the location of the hot spot. In our case, this is (1,1). The new location flashes for a short moment. The new hot spot location is now defined. 12. The animated cursor is now finished. We recommend to test it by using the "live test" button: . 13. Save your cursor: Choose File/Save (Ctrl+S) or add it to the Librarian (F3). It will be saved as Windows® CUR format. Congratulations! You've created your first cursor from Image Objects. There is no limit to your creativity using these objects. You can resize them, change their color, their opacity and more. You can even create your own objects by combining existing ones. 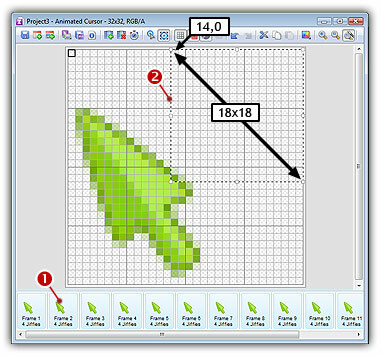 We can use similar techniques to create animated cursors. The drag & drop procedure will be similar but we'll be able to work on several frames simultaneously and work with animated filmstrip objects. 2. Type the name of the project ( ): "AppStarting". Specify the format of the animated cursor: In Color , choose "RGB with Alpha Channel (RGB/A 32 bits)" ( ). In Size in Pixels , choose and "32x32 (Windows Standard)" ( ). 3. In Frames, specify "1". 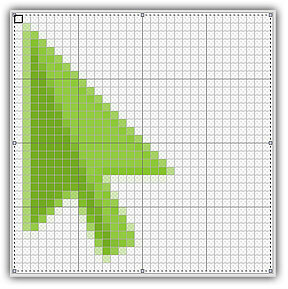 We'll start with one frame that we'll duplicate to create the non-animated portion of the cursor: the pointer. In Duration, specify "4". It means 4 jiffies = 4 x 1/60 sec = 66ms, which is perfect for the 12-frames cursor we want to create. 4. 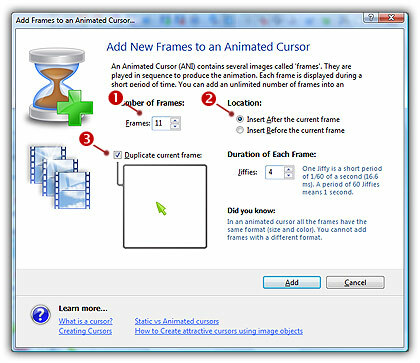 When done, click OK. A new animated cursor project window is created with the first frame added. 5. Now let's create the non-animated portion of the cursor: the mouse pointer. In the Librarian window (choose View/Librarian if it is not visible), select the "Objects/Pack 7 - Basic Cursors/Web 2.0 by Axialis" folder ( ). A list of available object is displayed in the contents window below ( ). Find the "Arrow.png" file and select it ( ). 6. 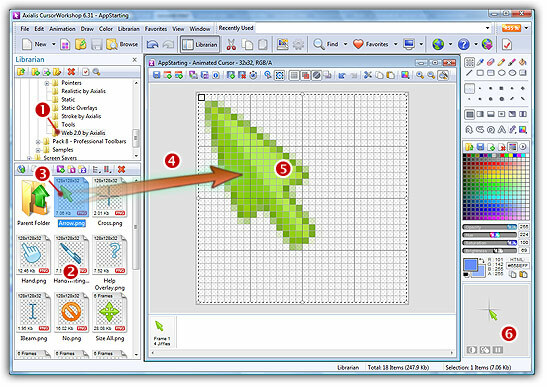 Use a mouse drag and drop to add it into the project ( ). The object is added to the project as a floating selection ( ). 9. In Number of Frames ( ), specify "11" since this is the number of frames to add. In Location, select "Insert After current frame" ( ). Select the option "Duplicate Current Frame" ( ) in order to create new frames containing copies of the initial image. In Jiffies, keep the value "4". Click OK, the 11 new frames are added to the animation. 10. Now, let's add the animated wait image in the upper-right corner. Before doing this me must inform CursorWorkshop "where" we want to add the next image object: In the upper-right corner of the cursor (not over the whole area) AND in the 12 frames (not only the selected one). 12. In the Librarian window, folder "Objects/Pack 7 - Basic Cursors/Web 2.0 by Axialis" ( ), find the file "Wait Large Torus Bold.png" and select it ( ). 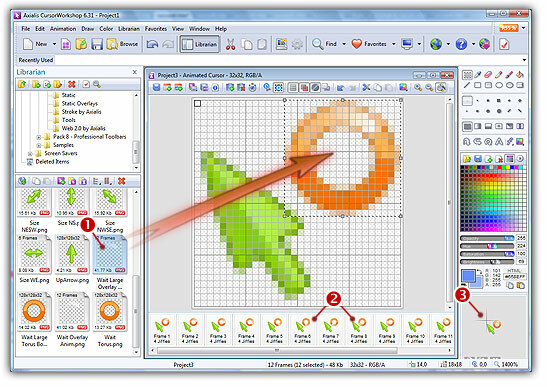 Use a mouse drag and drop to add it into the project ( ). 13. You're prompted by CursorWorkshop "Duplicate the Object on Selected Frames?". Click YES. 16. The last step is to set the hot spot. 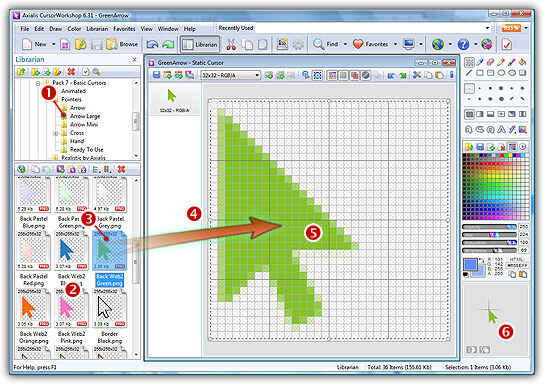 Select Draw/Set Cursor Hot Spot or press K. Click to the location of the hot spot. In our case, this is (1,8). The new hot spot location is now defined. 17. The animated cursor is now finished. We recommend to test it by using the "live test" button: . 18. Save your cursor: Choose File/Save (Ctrl+S) or add it to the Librarian (F3). It will be saved as Windows® ANI format.